"Brave and courageous Calabrians, unite now under the standard of the Holy Cross and of our beloved sovereign. Do not wait for the enemy to come and contaminate our home neighbourhoods. Let us march to confront him, to repel him, to hunt him out of our kingdom and out of Italy and to break the barbarous chains of our holy Pontiff. May the banner of the Holy Cross secure you total victory." The Sanfedismo movement nominally acted on behalf of Ferdinand I of the Two Sicilies. On January 25, 1799, two days after the proclamation of the Parthenopean Republic, Ferdinand appointed Ruffo, while both were taking refuge in Palermo, Sicily, to act as his vicar-general on the Italian mainland . Ruffo landed in Calabria on February 7 with no money or weapons and only eight companions, but bearing a banner with the royal arms on one side and a cross on the other, also bearing the ancient slogan "In hoc signo vinces." It took Ruffo a month to amass a force of 17,000; mostly peasants, but also "bandits, ecclesiastics, mercenaries, looters, devotees, and assassins." By the end of April, the Sanfedisti had subdued the entirety of Calabria and most of Apulia, and by June had begun a land siege of the city of Naples. 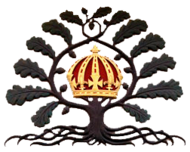 In the siege, the Sanfedismo irregulars were supported by a British naval force under the command of Horatio Nelson, for which Ferdinand gave Nelson the title of Duke of Bronte, which Nelson affixed to his signature for the rest of his life. The Parthenopean Republic collapsed on June 19, 1799. Most of the Sanfedisti victories occurred in rugged terrain, which was "well-suited" to the irregular style of warfare employed by Ruffo. Similar to other anti-French uprisings in Italy, the Sanfedisti were not, as a rule, amiable towards Jews, who were perceived as supporters of the Enlightenment ideology. Furthermore, Bishop Giovanni Andrea Serrao, the Jansenist leader in southern Italy and a supporter of the Parthenopaean Republic, was summarily executed on February 24, 1799, by the soldiers of the Potenza guard, as Ruffo's forces were drawing near to the city. 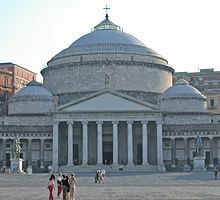 Church of San Francesco da Paola, Naples, in a ponderous academic neoclassical style, completed in 1816 as Ferdinand's ex voto for his return. The role of Cardinal Ruffo in the movement was a contemporary source of controversy, attributing to Ruffo both cruelty and bloodlust; apologist writings defending him are only extant with respect to the sack of Altamura. The name of Sanfedismo itself was a source of criticism, dubbed "a word sprung up, by which this new phase of wickedness might be called" by a contemporary. Sanfedismo, and Ruffo himself, became synonymous with the "recalcitrant, truly counter-revolutionary clergy" as opposed to those who were more sympathetic to the French Revolution. The name "Sanfedisti" was also used by Bourbonist peasant uprisings against the House of Savoy during Italian unification. The Canto dei Sanfedisti is still remembered by heart among many in the Mezzogiorno, and sometimes sung by folk groups. It is a parody of La Carmagnole, a popular French Revolutionary song. Later scholarly views of the Sanfedisti have dubbed them a "counter-revolutionary" group, but not homogeneously a "reaction[ary]" one. ^ a b Burkle-Young, 2000, p. 7. ^ Duffy, 2006, p. 260. ^ Chambers, 2006, p. 180-181. ^ Lord, 1970, p. 227. ^ a b c d Chadwick, 1981, p. 474. ^ a b c d e Chambers, 2006, p. 181. ^ Chambers, 2006, p. 182. ^ Brauer and Wright, 1990, p. 67. ^ Lyons, 1994, p. 22. ^ Chadwick, 1981, p. 475. ^ Broers, 2002, p. 90. ^ Martin, 1969, p. 231. ^ Robertson, 1999, p. 23. Chambers, David Sanderson. 2006. Popes, Cardinals & War. I.B. Tauris. ISBN 1-84511-178-8. Lord, Walter Frewen. 1970. England and France in the Mediterranean, 1660-1830. S. Low, Marston. Martin, George Whitney. 1969. The Red Shirt and the Cross of Savoy. Dodd, Mead.